The 2018-2019 School year marks the beginning of a new athletic opportunity for the students of Portsmouth West High School. Fifteen high school and three junior high school students are involved in the program. It didn’t take long for these lucky few, the “Original 18” to realize that swimming on the West High School team wasn’t going to be easy. Being a member of this team meant cold, late nights at SSU and sore muscles. Members are expected to learn all four major swim techniques (with proper dives and turns). Those techniques are the backstroke, breaststroke, butterfly and freestyle and in order to be competitive, our Senators are asked to specialize in two techniques. At the end of the day, being part of this team has been an overwhelmingly positive and incredibly healthy experience for our young men and women. 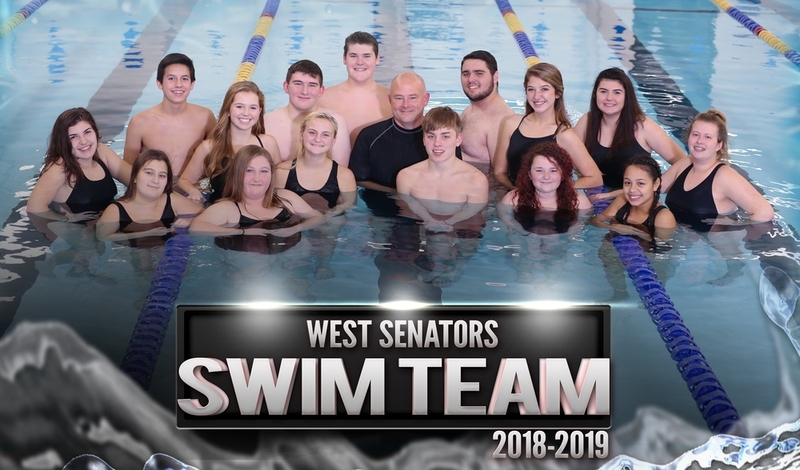 The Senator Swim team is coached by head coach Eric Nichols and assistant coach Carolyn Callihan. The team manager is third grade West student Gabe Nichols. As part of an effort to ensure the long term success of the Swim team here at Portsmouth-West, Coach Nichols started what he called the Portsmouth West Jr. High “Ambassador Program.” Three 8th grade students came forward and took the challenge: Sydney “Syd” Burchett, Madison “Mighty Minnow” Fleenor and Kirsten “Nemo” Whisman. These 8th graders had their first meet on December 15th and had some very strong finishes and near victories. Now that these ladies have the first meet “jitters” out of their system, Coach Nichols and Callihan are very, very optimistic of the future of these young ladies and the Senator Swim Team. The members of the high school team are also already experiencing some successes in their individual “heats,” and some of our athletes are placing very well in the individual and group events against the local teams such as Portsmouth, Notre Dame, Wheelersburg and Northwest. Senator Swim team members Hayden Runions, Noah Nichols and Sharon Macias have already been featured in the Scioto Voice and the Scioto Voice also plans to run a featured article in December 2018 on the start of our new West team. After the holiday break the Senator Swim Team continues their season with a meet against Northwest, Burg and Notre Dame on January 3rd at the Shawnee State University Warsaw Natatorium. We would like to thank the many sponsors and contributors that have made this season financially possible. Coach Callihan and I could not be more pleased with the performance and positivity of our student athletes thus far. In closing, if you will be a high school student next year and you think you have what it takes, we “dare” you to come join us next season. Just Keep Swimming!